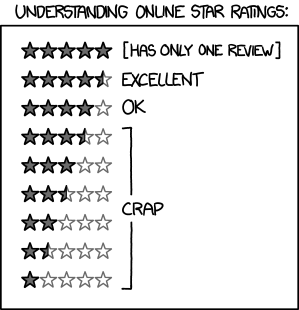 I spend too much time looking at reviews. Because I am an author, and therefore neurotic. And have no one to duct tape my hands behind my back to prevent me from setting up Google Alerts. Although I may jump around the office and swear a bit when I find a negative review, I don’t really care all that much. Everyone is entitled to an opinion. Even Jesus Christ did not get a one hundred percent approval rating. I wasn’t expecting one. And extra points to you, if you can come up with something negative, but creative. I like those. To the person who said something about my story leaving a stench in your brain that took a month to clear? I’m glad my book stuck with you that long. I remember your review, as well. It made me smile. I recommend getting a blog. You can say anything on those. But in the internet time not devoted to ego-Googling and self obsession, I get to see how other authors deal with reviews. Apparently, I’ve been doing it wrong. I could go the R J Ellory route, and write 5 star reviews for myself while sandbagging the competition. Or I could go the John Locke route and buy good reviews in bulk. #1 son also explained that it is possible to buy Twitter followers. One of his friends is did it and is getting free stuff from companies who want him to tweet about them to his imaginary friends. It’s not that I don’t understand the temptation. I’ve just sent out another round of review copies, before the release of Two Wrongs Make a Marriage. And I already know that some of these free books are going to result in nothing. Reviewers are busy. It’s hard to get them to take the time to hate you, much less write a quotable love letter. I value whatever mentions I can get. Even the bad ones. And another totally, insincere, eye-rolling, sarcastic “thanks a whole bunch” to the folks gaming the system. If it weren’t for you, I probably wouldn’t have bought a couple of highly praised books, only to through them against the wall and demand to know what is wrong with people who would give such a POS five stars. And while we’re at it, how did the author get so popular on Twitter? (I think I know). Because of people like you, we never would have gotten this comic from xkcd. I also never would have had to contend with someone commenting on one of my better reviewed books Need to Know, that those five stars had to be from my mother, or something. If that person had met my mother, he/she would know that she’d never have given me a 5 star review, much less several of them. I am pretty sure she thinks sock puppets are made with real socks (which she does not wear). Unless you think a sock puppet could be made from orthopedic compression hose. But I don’t know if it would give five stars either. There is also the fact that, when the subject of my writing ability comes up around the old homestead, we are headed towards an argument. My father insists that it came from his side of the family. And my mother insists it came straight from Jesus. Like Jesus was looking for a career with Mills & Boon. Maybe my mother would give a five star review, after all. She definitely gives Jesus two thumbs up.